How could I ever have found this guy attractive? It’s been about two months now since I started following my strict anti-inflammatory diet. The biggest challenge to this new way of eating is my monstrous sweet tooth, which has only gotten more insistent as this kid inside me grows. 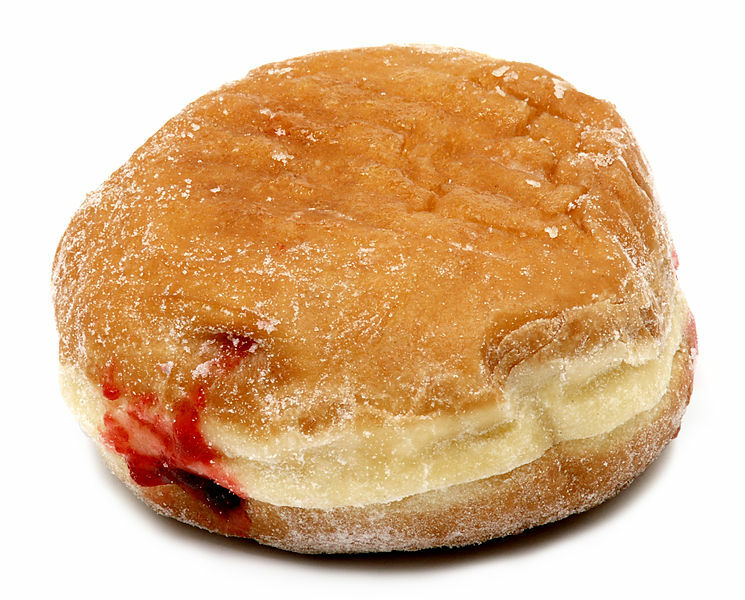 During my last pregnancy, I subsisted mainly on chocolate croissants, sugary cereal and jelly doughnuts (which I usually find completely disgusting). Despite the huge, everything-you-could-possibly-want cafeteria spanning the entire first floor of the Fortune 50 company I worked for at the time, I recall leaving the building to drive to Dunkin Donuts and buy a jelly doughnut. More than once. Eating whatever I wanted was how I got through my first pregnancy. When I felt crappy, I ate. When I was scared or tired or fed up with being pregnant, I ate. This time around, I’m missing both the amazing smorgasbord of food all hours of the day and my sugar-laden support group. 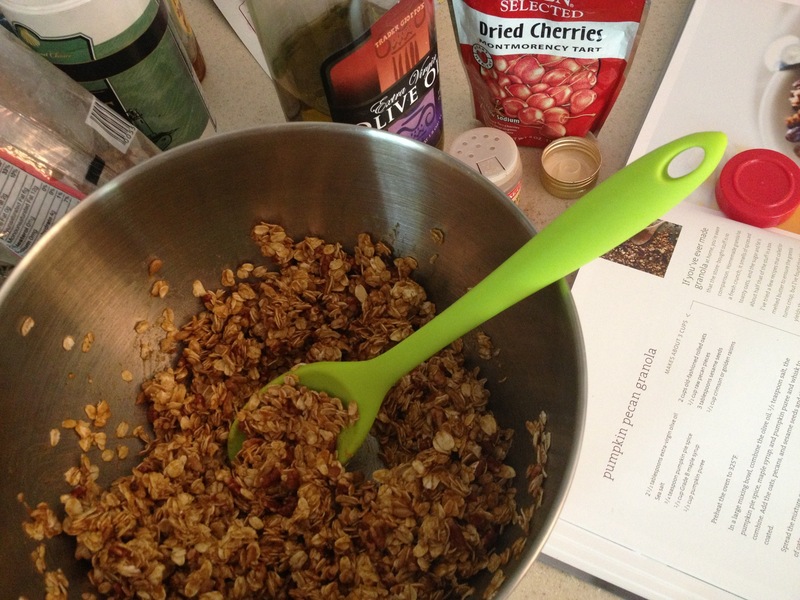 So you can imagine how excited I was yesterday to have something akin to a treat: homemade granola. The recipe I followed is from the beautiful cookbook, “The Sprouted Kitchen,” by Sara Forte, and it’s been republished on the blog, Delightful Crumb. The recipe was simple and so much healthier than the store-bought stuff — not to mention much, much tastier. I don’t care for raisins so I substituted dried cherries (with no added sugar) and decreased the amount of maple syrup called for in the recipe. I also found mine was plenty brown after 25 minutes, rather than the recommended 35-45. Another perk of making your own granola is having more than one serving — as long as you can keep yourself from eating the entire batch warm out of the oven. (It was not easy.) This morning, I made Angela Liddon’s Pumpkin Pie Oatmeal from her amazing blog, Oh She Glows. (If you’ve never visited this blog, you must do so immediately. Her recipes are mostly free of meat, dairy, gluten, soy and processed foods, and everything I’ve made has been delicious.) I topped it off with some of the granola and it was pure heaven. If you’re following an anti-inflammatory diet, don’t mistake this stuff for the perfect food. Although the ingredients are all pretty wholesome (oats, pumpkin, spices, olive oil, etc. ), I’m still careful not to eat it on an empty stomach. I start every meal with protein — especially first thing in the morning — and save anything that’s higher in sugar or carbs for after I’ve eaten something more substantial. This prevents a rapid rise in blood sugar, which is widely considered to be pro-inflammatory. Since I’ve been following this dramatically healthier diet, I’ve made some crazy discoveries. I’ve been shocked to find that my taste buds are rapidly expanding and widening their world view. Whereas I used to just melt cheese over everything I ate, now I’m seasoning my food with interesting spices and flavors from nature. Foods I didn’t like before — such as pumpkin! — are suddenly tasting wonderful to me. I’m loving ginger (a great anti-inflammatory food) and can’t get enough spicy mustard. Is it possible my tastes are finally growing up? Posted in Food, Health, Parenting, Pregnancy and tagged Anti-inflammatory recipes, Changing tastes during pregnancy, healthy eating, Healthy recipes, Homemade granola. Bookmark the permalink. © The Bump Life, 2013. Unauthorized use and/or duplication of this material without express and written permission from this blog’s author and/or owner is strictly prohibited. Excerpts and links may be used, provided that full and clear credit is given to The Bump Life with appropriate and specific direction to the original content.